Data in the 2014 UBA Health Plan Survey is based on responses from 9,950 employers sponsoring 16,967 health plans nationwide. Results are applicable to the small to midsize market that makes up a majority of American businesses, as well as to larger employers, providing benchmarking data on a more detailed level than any other survey. 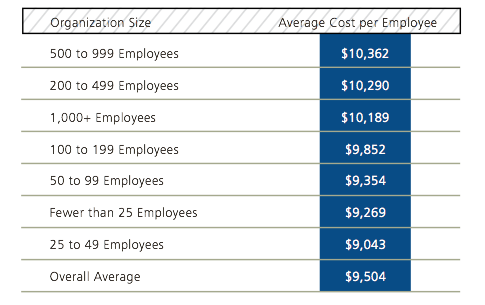 To help employers benchmark their health plan costs by organization size, the chart below shows average costs in descending order.